Visit www.wche1520.com on Sunday, September 7, 2014 at 3:00 PM to listen to a streamed interview of Janet Killian on Executive Leaders Radio. Janet was the only women entrepreneur included in this group of area business leaders. Their stories will inspire you as they share their secrets of success. 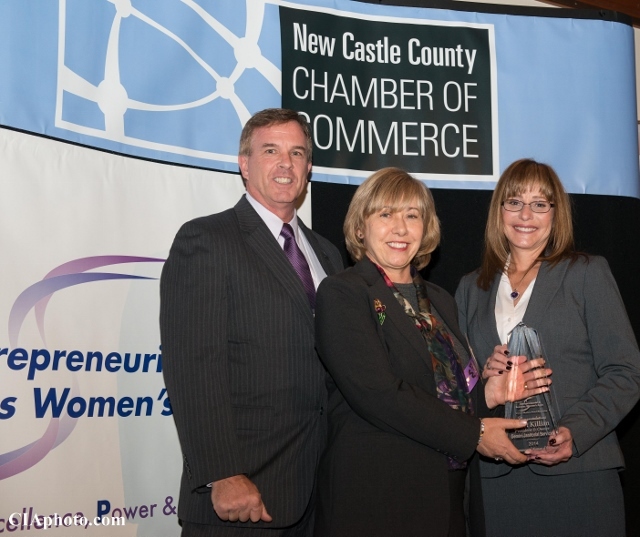 Janet Killian, President, Gemini Janitorial Services, is the 2014 Entrepreneurial Woman of the Year. 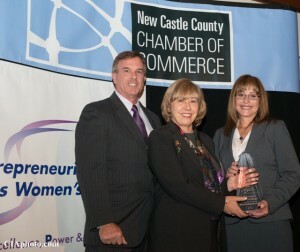 New Castle County Chamber President Mark Kleinschmidt, 2013 Entrepreneurial Woman of the Year Connie Charles and 2014 Entrepreneurial Woman of the Year Janet Killian. ☻Roughly 25% of buttons on water coolers host bacteria that can cause illnesses. ☻Bacteria can grow by as much as 31% every single day on surfaces that are not routinely being disinfected. ☻More than a few studies have shown that it is actually easier to clean toilets, than a keyboard or a mouse!